With Thanksgiving approaching, I just wanted to highlight a few of my favorite recipes. 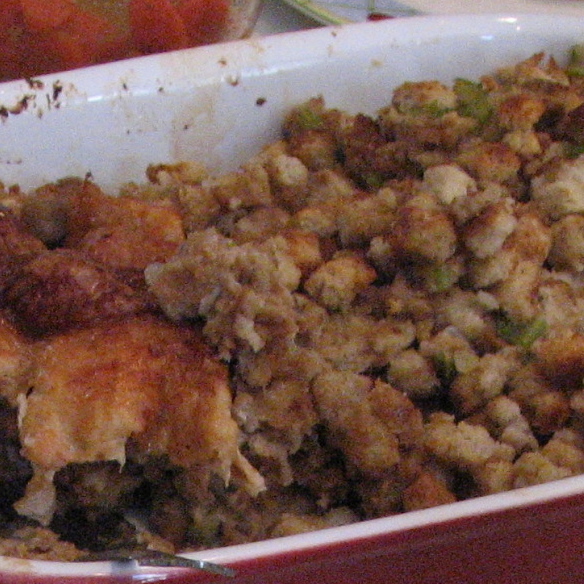 Turkey and Stuffing is a given – I don’t think I need to post a recipe for that though, because everyone likes their own recipe – I made the mistake of trying out a new recipe at Thanksgiving once for the stuffing and I was truly sorry I had tried something new on that day. The day to experiment is not on Thanksgiving when it comes to the essentials. 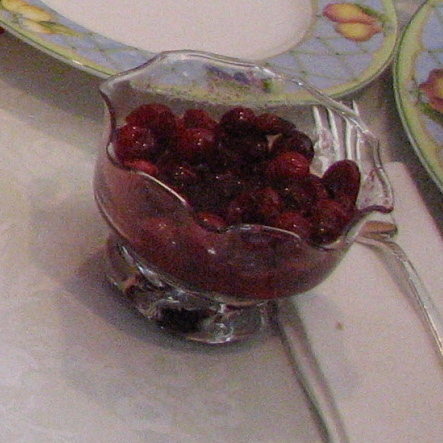 I do love Martha Stewart’s recipe for Cranberry Compote. I alternate that with my grandmother’s recipe for cranberry relish that is processed with apples, pineapples, and oranges. The apples and oranges are washed but processed with the peel. It gives it a nice tart flavor. I double the recipe,(amounts are doubled) because the single recipe never seems enough for more than a meal. I also reduced the sugar amount because I found it plenty sweet with less sugar. Combine all the ingredients in a medium saucepan. Place over medium-high heat; cook, stirring occasionally, until the berries begin to pop but are still whole (7-10 minutes). Transfer to a bowl to cool. Good hot or cold. Blend ingredients in a blender or food processor. Best when prepared a day in advance or more. It keeps in refrigerator for up to 2 weeks. Put the broccoli in a covered pot with an inch of water and seasoned with salt. Bring to a boil and reduce the heat to low, cover and steam for about 10 minutes until it is a nice dark green. 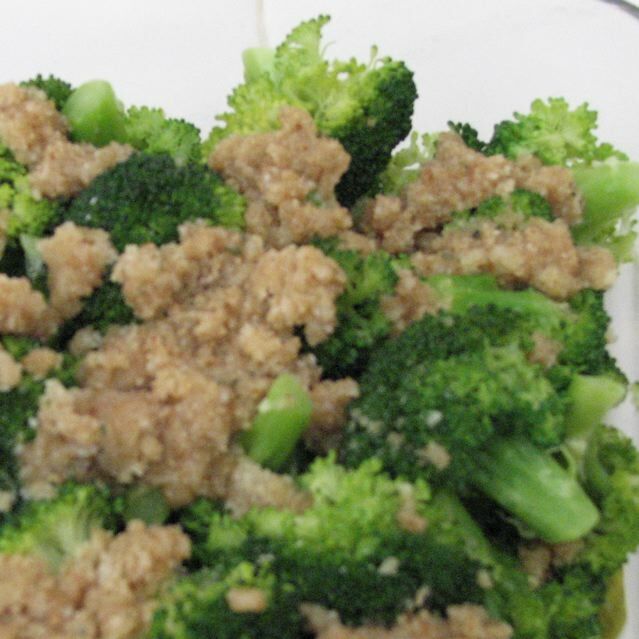 Drain the broccoli and transfer to a baking dish. Melt the butter and combine with bread crumbs and Parmesan cheese. Sprinkle over the broccoli. Bake at 325-350 for 15 minutes until the crumb topping is golden brown and the cheese melts a little. Enjoy. If you wish sprinkle more freshly grated Parmesan cheese and sprinkle some lemon juice over the dish. Place the carrot slices in a pan. Cover with water and add salt. Bring to boil, reduce heat and cover. Cook for 15 minutes (test them at 10 minutes – depending on the size of the carrot slices they make be done early and we don’t want them to boil to mush!) Drain water. Add butter, nutmeg and honey. Stir and serve. Categories: Holidays, Thanksgiving | Permalink. 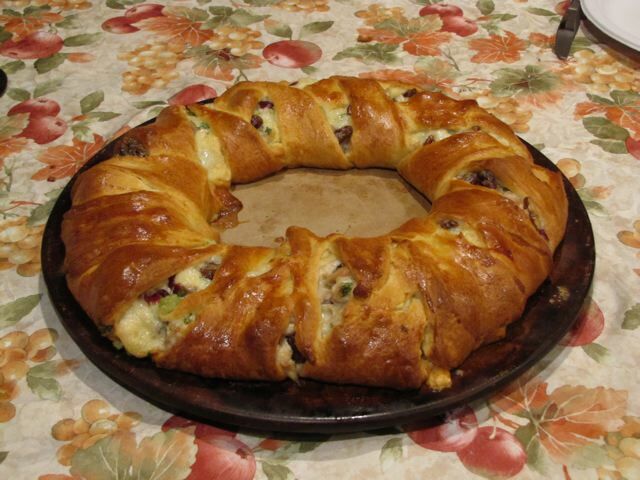 I bought a larger turkey than usual this year, and have slightly more left overs than usual, but my favorite way to use up some of those leftovers is making my Turkey Cranberry Wreath. 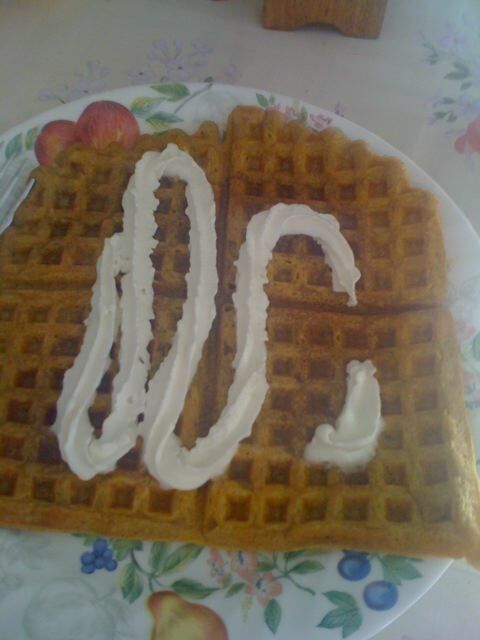 It is a hit with everyone who tries it. I am sure you will enjoy it too. If you prefer to have different nuts, you could substitute walnuts or almonds for the pecans. In a large bowl mix mayonnaise, mustard, black pepper, chopped turkey, celery, parsley, cranberries,and cheese together. Combine well. Scoop filling and place over seams of dough, forming a circle. Sprinkle with chopped nuts over filling. Beginning in center, lift one dough triangle across the mixture. Continue alternating with outer and inner strips, slightly overlapping to form a wreath. Tuck last end under the first. Whip egg white and brush over dough with a pastry brush. Bake for 25-30 minutes or until golden brown. Slice into 10 portions. This is really my all time favorite way to have turkey. My husband even says it is better than the main event. How often do you hear that the leftovers are better than the original? 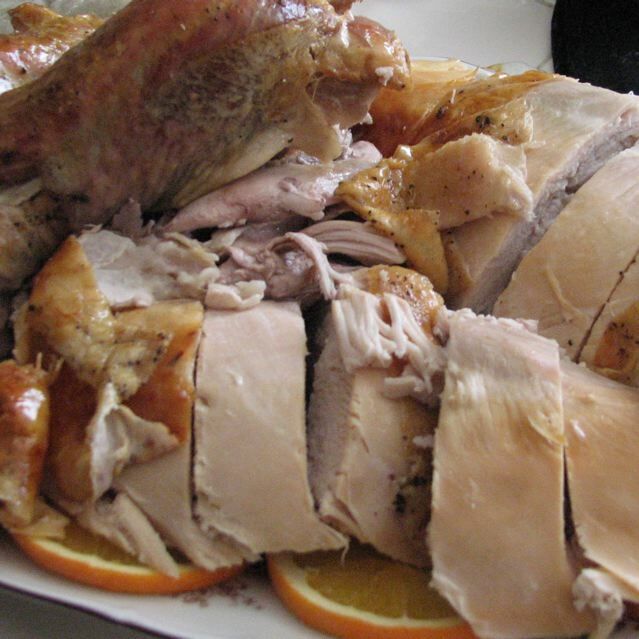 Categories: Holidays, Thanksgiving | Tags: Turkey Leftovers, Turkey recipe | Permalink. Wow, the year is going by fast. Thanksgiving is almost upon us. I thought I would post some of my favorite recipes that work for me. 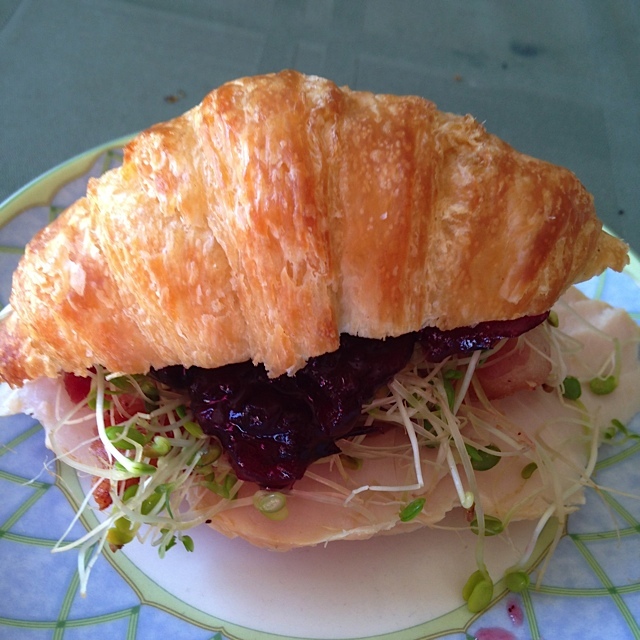 I make my turkey (always a Butterball) in a oven roasting bag and it turns out succulent every time! Just follow the directions on the roasting bag you will get great results! I season my turkey with salt and pepper, and sometimes rosemary. Stuffed with my mother’s recipe for stuffing. Accompanied with Parmesan Topped Broccoli, Cranberry sauce or relish – I have two recipes I really like and typically will make one recipe for Christmas and one for Thanksgiving. One of them is from a Martha Stewart cookbook and the other is my Grandmother’s recipe for cranberry relish (which only needs a food processor to make it – no cooking involved). 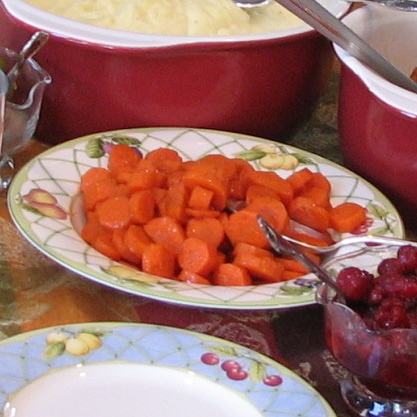 I always have giblet gravy and of course mashed potatoes, glazed carrots, desserts vary. Turkey and Giblet Gravy – Source: The Good Housekeeping Illustrated Cookbook Copyright 1989 This cookbook was a wedding gift from one of my sister in laws and I used this recipe my very first Thanksgiving. It has become my traditional recipe every year! Remove giblets and neck from inside turkey and reserve for gravy. Rinse bird with running cold water; drain well. Spoon some stuffing lightly into neck cavity (do not pack). Fold neck skin over and fasten with 1 or two skewers. With Bird breast side up lift wings up toward neck and fold under back of bird so they stay flat and keep neck skin in place. Spoon remaining stuffing lightly into body cavity. Close by folding skin lightly over opening; skewer closed. Place in Turkey Roasting bag and follow instructions for roasting times. (Takes less time in convection oven) The temperature of the bird should be 165 when the meat thermometer is inserted in the thickest part of the thigh (without touching the bone) otherwise it is not safe to eat! While turkey is roasting, heat giblets, neck , celery, onion, 1/2 tsp salt and water to cover to boiling. Reduce heat to low; cover and simmer for 1 hour (or more) till giblets are tender; Drain reserving broth; discard celery and onion. Chop neck meat and giblets. When turkey is done, remove rack from pan; pour pan drippings into a 4 cup measure; let drippings stand until fat separates from meat juice. Skim 1/3 cup fat from drippings into 2 quart saucepan; skim off and discard any fat remaining on surface of drippings. Into fat in saucepan over medium heat, stir flour and 1 1/2 tsp salt. 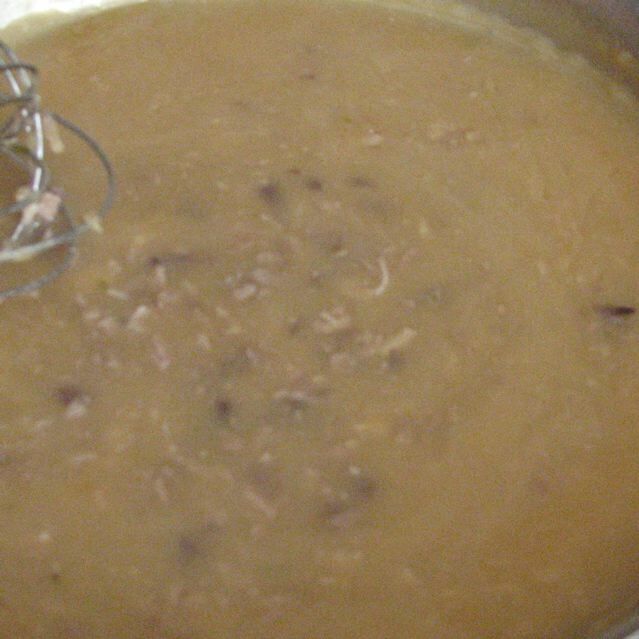 Gradually stir in meat-juice mixture; cook stirring until thickened. Add reserved chopped giblets and neck meat; cook until heated through. (NOTE: Bread recommendations: Rye, Pumpernickel, Whole Wheat and white bread) Yield: enough to stuff a 12 lb. Turkey. At Thanksgiving shortcuts are sometimes necessary and if the shortcut is really good, why not go with it? I like the frozen dinner rolls you can get in your local grocery store (Rhodes brand is my favorite) They are raw and just need to be baked. 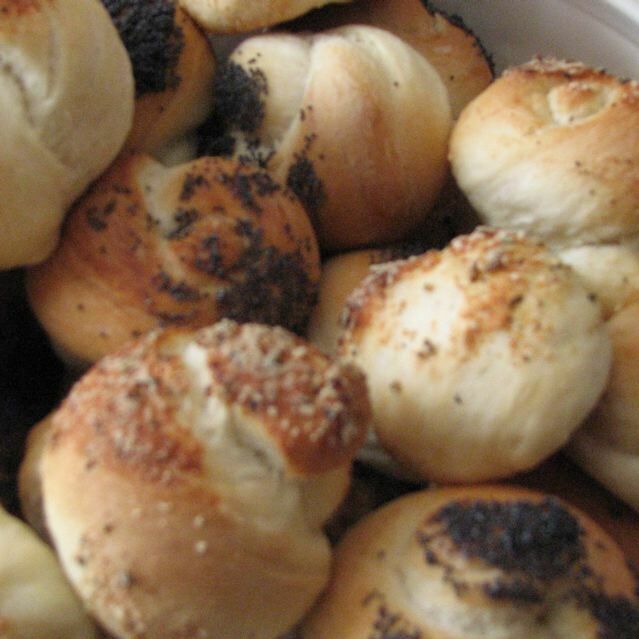 I like to dress them up with Sesame or Poppy seeds, or sprinkle with a Garlic Parmesan seasoning. If you buy the dough ones you can form them into different shapes as well. Here I made a “worm” and then tied it in a knot before brushing with egg white and sprinkling with poppy seeds and baking according to package directions. Categories: Favorite, Holidays, Thanksgiving | Permalink. Here is a recipe from the book that I adapted. Makes 8 dozen cookies. I freeze some for later. Blend the ginger with 1/2 cup of the oil. I use a hand blender. Process until well minced. In a large mixing bowl, mix 3 cups sugar, molasses and eggs. Strain the ginger/oil liquid and add the strained ginger infused oil to the sugar mixture. Add remaining cup of oil to the mixture and mix until smooth. In a separate bowl, combine the salt, cinnamon, baking soda, cloves and flour. Ad the dry ingredients to the wet mix and blend well. Place on prepared cookie sheet and bake for 8-12 minutes, just until the tops crack and cookies are flat. Leave on the cookie sheet a few minutes to firm up before removing them to wire racks to cook completely. Enjoy! 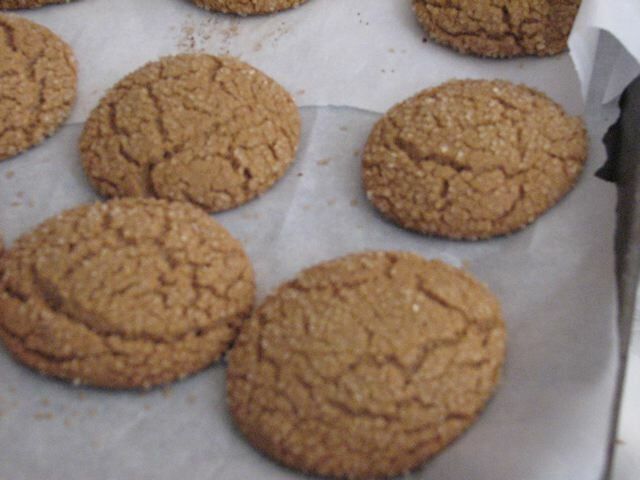 Categories: Baking, Baking - Cookies, Baking - Desserts, Christmas, Dessert - Cookies, Favorite, Holidays, Thanksgiving | Tags: Black Dog Restaurant, Chewy Ginger Cookies, Ginger Cookies | Permalink.